Cherif Kouachi, one of the gunmen who launched a deadly attack on French satirical magazine Charlie Hebdo, has been buried in an unmarked grave. Kouachi was buried overnight in his hometown, Paris suburb Gennevilliers, amid tight security, an official said. His brother Said Kouachi was buried on Friday in the eastern city of Reims. The brothers killed 12 people in the 7 January attack in Paris. 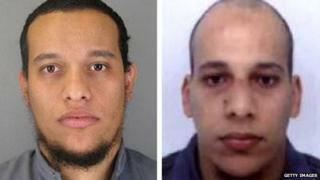 They were killed by police two days later during a standoff north of Paris. They had claimed the attack - supported by al-Qaeda in the Arabian Peninsula - was in response to Charlie Hebdo's publication of cartoons depicting the Prophet Muhammad. The magazine's first edition after the attack features a new cartoon in which the Prophet is shown weeping, holding an "I am Charlie" sign - the message of support for the magazine - and saying "All is Forgiven". There have been protests in several countries against the weekly magazine, which has issued a print run of seven million copies in view of extraordinary demand. Before the attack it distributed 60,000 issues. A week after millions took to the streets of France to voice support for free speech, a new poll commissioned by Le Journal du Dimanche (in French) suggested 42% of French people thought Prophet Muhammad cartoons should not be published, 57% believed they should and 1% had no view. Both Kouachi brothers have been buried in unmarked graves to prevent them from becoming shrines for Islamists. There has been no announcement on plans for burying Amedy Coulibaly, who killed four people at a Jewish supermarket in Paris on 9 January and is suspected of killing a policewoman in the French capital a day earlier. An official from the Gennevilliers mayor's office told AFP that no relatives had attended Cherif Kouachi's burial. The grave was unmarked amid concerns it could become "a pilgrimage site" for jihadists, the official said. Earlier in the week, Reims mayor Arnaud Robinet said he would "categorically refuse" a family request for Said Kouachi to be buried in the city. However on Saturday he said he had been forced by the government to accept the burial. The burial was conducted "in the most discreet, anonymous way possible," he told French TV. French law gives residents of a town the right to a burial there. A lawyer for Said Kouachi's widow said she had not attended the burial for fear that journalists would follow her and the location of the grave would be discovered. Almost 15,000 extra police and troops have been mobilised to boost security across France since the attacks. Soldiers have also been sent onto the streets in neighbouring Belgium, where officials said they had foiled a possible attack against the police when they shot dead two suspects on Thursday in the eastern city of Verviers. Some 150 soldiers were deployed in Brussels and Antwerp on Saturday, a number that is expected to double over the coming week. Meanwhile, there have been protests in several countries against a cartoon in this week's edition of Charlie Hebdo depicting the Prophet Muhammad. In Niger, at least 10 people have been killed in violent protests against the magazine. Churches were set on fire in the capital, Niamey, and in the city of Zinder.